One thing that I love about Z’tejas is the yummy cornbread they put on the table before your meal. I could totally just take that and eat it as a meal in and of it’s self! Well one day when I was looking up the phone number to one of the locations, I stumbled upon a section on their website with some of their recipes! What restaurant out there is willing to publish their recipes? Usually that is top secret! 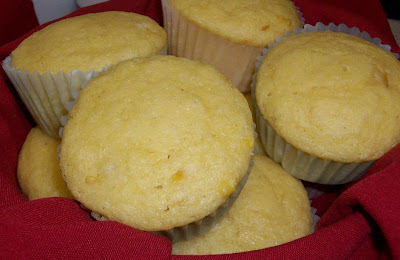 I was even more thrilled when I saw their corn bread recipe was on of the featured recipes! This corn bred is sooo good and went perfect with a big ole bowl of chili I made a while back (geez that’s how far behind I am! I posted that chili recipe way back in August, I guess it is time to make it again since the weather is FINALLY starting to cool down around here). At Z’tejas they make this cornbread in a cast iron skillet (so it is a thin cornbread when made that way). I don’t have a cast iron skillet, at least I didn’t think I did, but then a few days after making this cornbread I found one on my top shelf! So I made half of this batter into cornbread muffins and also made half in a 8×8 pan. The muffins came out better than the ones in the 8×8 pan, I think because the cake pan made them too thick. This is an extremely moist cornbread, so the key is to either defiantly cook them in a cast iron skillet or to do muffins and cook them for a long enough time, until at least golden brown on top and done thoroughly (this is key information for your muffins to turn out like the original from Z’tejas! Mix all dry ingredients together in a medium bowl. In a large mixing bowl, whisk yogurt, buttermilk, eggs and butter together. Add the creamed corn and frozen corn. Pour into a greased 9X13 pan or use a buttered cast iron skillet and fill the skillet or a muffin tin that has been greased or lined with cupcake liners. Bake at 375 degrees for about 20-25 minutes (check with a toothpick that should come out clean).